Angelo Fausto Coppi (Italian pronunciation: [ˈfausto ˈkɔppi]; 15 September 1919 – 2 January 1960) was an Italian cyclist, the dominant international cyclist of the years each side of the Second World War. His successes earned him the title Il Campionissimo ("Champion of Champions"). He was an all-round racing cyclist: he excelled in both climbing and time trialing, and was also a great sprinter. He won the Giro d'Italia five times (1940, 1947, 1949, 1952, 1953), the Tour de France twice (1949 and 1952), and the World Championship in 1953. Other notable results include winning the Giro di Lombardia five times, the Milan–San Remo three times, as well as wins at Paris–Roubaix and La Flèche Wallonne and setting the hour record (45.798 km) in 1942. Coppi was born in Castellania (now known as Castellania Coppi), near Alessandria, one of five children born to Domenico Coppi and Angiolina Boveri, who married on 29 July 1914. Fausto was the fourth child, born at 5:00 pm on 15 September 1919. His mother wanted to call him Angelo, but his father preferred Fausto. He was named Angelo Fausto but was known most of his life as Fausto. Coppi had poor health as a child and showed little interest in school. In 1927 he wrote "I ought to be at school, not riding my bicycle" after skipping lessons to spend the day riding a family bike which he had found in a cellar, rusty and without brake blocks. He left school at age 13 to work for Domenico Merlani, a butcher in Novi Ligure more widely known as Signor Ettore. "... [My uncle] was a merchant navy officer on a petrol tanker, and a real cycling fan. He was touched when he heard of my passion for the bike and decided that I deserved a real tool for the job on which I had set my heart, instead of the rusty old crock I was pushing around. I just cried with joy when my kind uncle gave me the 600 lire that were to make my dream come true. I knew from advertisements I had seen in the local papers that for 600 lire I could get a frame built to my measurements in Genoa. Out of my slender savings I took enough for the train fare to Genoa and back, gave my measurements, and handed over the 600 lire. I would have to buy the fittings and tyres from my errand-boy salary. Oh how my legs used to ache at night through climbing all those stairs during the day! But I'm glad I did, because it surely made my legs so strong". "Come back within a week; your frame will be ready" said the owner of the cycle shop". "But it wasn't ready, and not the next week, and not the next. For eight weeks I threw precious money away taking the train to Genoa and still no made-to-measure bike for me. The fellow just couldn't be bothered making a frame for a skinny country kid who didn't look as if he could pedal a fairy-cycle, let alone a racing bike. I used to cry bitterly as I went back home without the frame. On the ninth journey I took a frame home. But it wasn't a 'made to measure'. The chap just took one down off the rack. I was furious inside, but too shy to do anything about it". Coppi rode his first race at age 15, among other boys not attached to cycling clubs, and won first prize: 20 lire and a salami sandwich. Coppi took a racing licence at the start of 1938 and won his first race, at Castelleto d'Orba, near the butcher's shop. He won alone, winning an alarm clock. A regular caller at the butcher's shop in Novi Ligure was a former boxer who had become a masseur, a job he could do after losing his sight, in 1938. Giuseppe Cavanna was known to friends as Biagio. Coppi met him that year, recommended by another of Cavanna's riders. Cavanna suggested in 1939 that Coppi should become an independent, a class of semi-professionals who could ride against both amateurs and professionals. He sent Coppi to the Tour of Tuscany that April with the advice: "Follow Gino Bartali!" He was forced to stop with a broken wheel. But at Varzi on 7 May 1939 he won one of the races counting to the season-long national independent championship. He finished seven minutes clear of the field and won his next race by six minutes. His first large success was in 1940, winning the Giro d'Italia at the age of 20. In 1942 he set a world hour record (45.798 km at the Velodromo Vigorelli in Milan) which stood for 14 years until it was broken by Jacques Anquetil in 1956. His career was then interrupted by the Second World War. In 1946 he resumed racing and achieved remarkable successes which would be exceeded only by Eddy Merckx. The veteran writer Pierre Chany said that from 1946 to 1954 Coppi was never once recaught once he had broken away from the rest. Twice, 1949 and 1952, Coppi won the Giro d'Italia and the Tour de France in the same year, the first to do so. He won the Giro five times, a record shared with Alfredo Binda and Eddy Merckx. During the 1949 Giro he left Gino Bartali by 11 minutes between Cuneo and Pinerolo. Coppi won the 1949 Tour de France by almost half an hour over everyone except Bartali. From the start of the mountains in the Pyrenees to their end in the Alps, Coppi took back the 55 minutes by which Jacques Marinelli led him. Coppi won the Giro di Lombardia a record five times (1946, 1947, 1948, 1949 and 1954). He won Milan–San Remo three times (1946, 1948 and 1949). In the 1946 Milan–San Remo he attacked with nine others, five kilometres into a race of 292 km. He dropped the rest on the Turchino climb and won by 14 minutes. He also won Paris–Roubaix and La Flèche Wallonne (1950). He was also 1953 world road champion. Comparing riders from different eras is a risky business subject to the prejudices of the judge. But if Coppi isn't the greatest rider of all time, then he is second only to Eddy Merckx. One can't judge his accomplishments by his list of wins because World War II interrupted his career just as World War I interrupted that of Philippe Thys. Coppi won it all: the world hour record, the world championships, the grands tours, classics as well as time trials. The great French cycling journalist, Pierre Chany says that between 1946 and 1954, once Coppi had broken away from the peloton, the peloton never saw him again. Can this be said of any other racer? Informed observers who saw both ride agree that Coppi was the more elegant rider who won by dint of his physical gifts as opposed to Merckx who drove himself and hammered his competition relentlessly by being the very embodiment of pure will. Coppi broke the world hour record on the track in Milan on 7 November 1942. He rode a 93.6 inch (7.47 metre) gear and pedaled with an average cadence of 103.3rpm. The bike is on display in the chapel of Madonna del Ghisallo near Como, Italy. Coppi beat Maurice Archambaud's 45.767 km, set five years earlier on the same track. The record stood until it was beaten by Jacques Anquetil in 1956. In 1955 Coppi and his lover Giulia Occhini were put on trial for adultery, then illegal in Italy, and got suspended sentences. The scandal rocked conservative ultra-Catholic Italy and Coppi was disgraced. Coppi's career declined after the scandal. 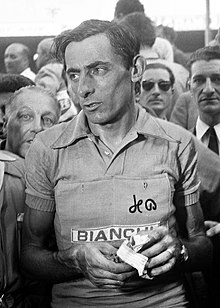 He had already been hit in 1951 by the death of his younger brother, Serse Coppi, who crashed in a sprint in the Giro del Piemonte and died of a cerebral haemorrhage. [n 1] Coppi could never match his old successes. Pierre Chany said he was first to be dropped each day in the Vuelta a España in 1959. Criterium organisers frequently cut their races to 45 km to be certain that Coppi could finish, he said. "Physically, he wouldn't have been able to ride even 10km further. He charged himself [took drugs] before every race". Coppi, said Chany, was "a magnificent and grotesque washout of a man, ironical towards himself; nothing except the warmth of simple friendship could penetrate his melancholia. But I'm talking of the end of his career. The last year! In 1959! I'm not talking about the great era. In 1959, he wasn't a racing cyclist any more. He was just clinging on [il tentait de sauver les meubles]." Jacques Goddet wrote in an appreciation of Coppi's career in L'Équipe: "We would like to have cried out to him 'Stop!' And as nobody dared to, destiny took care of it." When Fausto won and you wanted to check the time gap to the man in second place, you didn't need a Swiss stopwatch. The bell of the church clock tower would do the job just as well. Paris–Roubaix? Milan–San Remo? Lombardy? We're talking 10 minutes to a quarter of an hour. That's how Fausto Coppi was. "This mercurial beginner [Fausto Coppi] joined Bartali's team in 1940, and then won the Giro d'ltalia with a massive lead over his team leader. Bartali was astonished and affronted. Henceforward, the two riders were in personal combat—it often seemed that, as fierce rivals, they cared less about winning a race than beating each other". "Bartali belongs to those who believe in tradition... he is a metaphysical man protected by the saints. Coppi has nobody in heaven to take care of him. His manager, his masseur, have no wings. He is alone, alone on a bicycle... Bartali prays while he is pedalling: the rational Cartesian and sceptical Coppi is filled with doubts, believes only in his body, his motor". Their lives came together on 7 January 1940 when Eberardo Pavesi, head of the Legnano team, took on Coppi to ride for Bartali. Their rivalry started when Coppi, the helping hand, won the Giro and Bartali, the star, marshalled the team to chase. By the 1948 world championship at Valkenburg, Limburg in the Netherlands, both climbed off rather than help the other. The Italian cycling association said: "They have forgotten to honour the Italian prestige they represent. Thinking only of their personal rivalry, they abandoned the race, to the approbation of all sportsmen". They were suspended for three months. The thaw partly broke when the pair shared a bottle on the Col d'Izoard in the 1952 Tour[n 2] but the two fell out over who had offered it. "I did", Bartali insisted. "He never gave me anything". Their rivalry was the subject of intense coverage and resulted in epic races. The British moved Coppi to an RAF base at Caserta in Italy in 1945. There he worked for an officer who had never heard of him. Coppi was allowed liberal terms, the war being as good as over. On release he cycled and hitched lifts home. On Sunday 8 July 1945 he won the Circuit of the Aces in Milan after four years away from racing. The following season he won Milan–San Remo (about these years see also "Viva Coppi! ", a historical novel written by Filippo Timo). Coppi's beloved, "The Woman in White" was Giulia Occhini, described by the French broadcaster Jean-Paul Ollivier as "strikingly beautiful with thick chestnut hair divided into enormous plaits". She was married to an army captain, Enrico Locatelli. Coppi was married to Bruna Ciampolini. Locatelli was a cycling fan. His wife wasn't but she joined him on 8 August 1948 to see the Tre Valli Varesine race. Their car was caught beside Coppi's in a traffic jam. That evening Occhini went to Coppi's hotel and asked for a photograph. He wrote "With friendship to...", asked her name and then added it. From then on the two spent more and more time together. Italy was a strait-laced country in which adultery was thought of poorly. In 1954, Luigi Boccaccini of La Stampa saw her waiting for Coppi at the end of a race in St-Moritz. She and Coppi hugged and La Stampa printed a picture in which she was described as la dama in bianco di Fausto Coppi—the "woman in white of Fausto Coppi". It took only a while to find out who she was. She and Coppi moved in together but so great was the scandal that the landlord of their apartment in Tortona demanded they move out. Reporters pursued them to a hotel in Castelletto d'Orba and again they moved, buying the Villa Carla, a house near Novi Ligure. There police raided them at night to see if they were sharing a bed. Pope Pius XII asked Coppi to return to his wife. He refused to bless the Giro d'Italia when Coppi rode it. The Pope then went through the Italian cycling federation. Its president, Bartolo Paschetta, wrote on 8 July 1954: "Dear Fausto, yesterday evening St. Peter made it known to me that the news [of adultery] had caused him great pain". Bruna Ciampolini refused a divorce. To end a marriage was shameful and still illegal in the country. Coppi was shunned and spectators spat at him. He and Giulia Occhini had a son, Faustino. "I slept in the same room as Coppi in a house infested by mosquitos. I'd got used to them but Coppi hadn't. Well, when I say we 'slept', that's an overstatement. It was like the safari had been brought forward several hours, except that for the moment we were hunting mosquitos. Coppi was swiping at them with a towel. Right then, of course, I had no clue of what the tragic consequences of that night would be. Ten times, twenty times, I told Fausto 'Do what I'm doing and get your head under the sheets; they can't bite you there'". "My temperature got to 41.6 °C... I was delirious and I couldn't stop talking. I imagined or maybe saw people all round but I didn't recognise anyone. The doctor treated me for hepatitis, then for yellow fever, finally for typhoid". Geminiani was diagnosed as being infected with plasmodium falciparum, one of the more lethal strains of malaria. Géminiani recovered but Coppi died, his doctors convinced he had a bronchial complaint. La Gazzetta dello Sport, the Italian daily sports paper, published a Coppi supplement. The editor wrote that he prayed that God would soon send another Coppi. Coppi was an atheist. In January 2002 a man identified only as Giovanni, who lived in Burkina Faso until 1964, said Coppi died not of malaria but of an overdose of cocaine. The newspaper Corriere dello Sport said Giovanni had his information from Angelo Bonazzi. Giovanni said: "It is Angelo who told me that Coppi had been killed. I was a supporter of Coppi, and you can imagine my state when he told me that Coppi had been poisoned in Fada Gourma, at the time of a reception organised by the head of the village. Angelo also told me that [Raphael] Géminiani was also present... Fausto's plate fell, they replaced it, and then..."
The story has also been attributed to a 75-year-old Benedictine monk called Brother Adrien. He told Mino Caudullo of the Italian National Olympic Committee: "Coppi was killed with a potion mixed with grass. Here in Burkina Faso this awful phenomenon happens. People are still being killed like that". Coppi's doctor, Ettore Allegri, dismissed the story as "absolute drivel". A court in Tortona opened an investigation and asked toxicologists about exhuming Coppi's body to look for poison. A year later, without exhumation, the case was dismissed. The Giro remembers Coppi as it goes through the mountain stages. A mountain bonus, called the Cima Coppi, is awarded to the first rider who reaches the Giro's highest summit. In 1999, Coppi placed second in balloting for greatest Italian athlete of the 20th century. Coppi's life story was depicted in the 1995 TV movie, Il Grande Fausto, written and directed by Alberto Sironi. Coppi was played by Sergio Castellitto and Giulia la 'Dama Bianca' (The Woman in White) was played by Ornella Muti. A commonly repeated trope is that when Coppi was asked how to be a champion, his reply was: "Just ride. Just ride. Just ride." An Italian Restaurant in Belfast, designed with road bike parts and pictures, is named Coppi. Asteroid 214820 Faustocoppi was named in his memory in December 2017. The village of his birth, previously known as 'Castellania', was renamed Castellania Coppi by the Piemont regional council in 2019, in preparation for the centenary of his birth. "The first thing was to make sure I always stayed at the same hotel for a race, and to have the room next to his so I could mount a surveillance. I would watch him leave with his mates, then I would tiptoe into the room which ten seconds earlier had been his headquarters. I would rush to the waste bin and the bedside table, go through the bottles, flasks, phials, tubes, cartons, boxes, suppositories – I swept up everything. I became so expert in interpreting all these pharmaceuticals that I could predict how Fausto would behave during the course of the stage. I would work out, according to the traces of the product I found, how and when he would attack me". Coppi was often said to have introduced "modern" methods to cycling, particularly his diet. Gino Bartali established that some of those methods included taking drugs, which were not then against the rules. Answer: Yes, and those who claim otherwise, it's not worth talking to them about cycling. ^ A parallel with Bartali, who also lost a brother, Giulio, in a 1936 racing accident. ^ Henry Anglade created a stained glass window of the incident; it is at the Notre Dame des Cyclistes chapel near Mont de Marsan, France. ^ His cycling friends called him Holy Head for years afterwards. ^ The award, along with a gold medal, given to the winner of a world championship. ^ "Gregari" are team riders, employed to help their better riders win. A gregario was a soldier of the Roman legions, "one into the group" Etimologia. They are equivalent to domestiques in France and knecht "servant" or "helper" in Belgium and the Netherlands. ^ Ollivier 1981, p. 12. ^ Ollivier 1981, p. 13. ^ Ollivier 1981, p. 85. ^ McGann & McGann 2006, p. 187. ^ Velominati (Keepers of the Cog) (2013). The Rules: The way of the cycling disciple. London: Sceptre. p. 71. ISBN 978-1-444-76751-3. ^ McGann & McGann 2006, p. 160. ^ "The Hour Record". Wolfgang-menn.de. Retrieved 2 October 2009. ^ "www.cyclingnews.com news and analysis". Autobus.cyclingnews.com. Retrieved 2 October 2009. ^ "Fausto Coppi". Archived from the original on 28 August 2007. Retrieved 12 May 2015. ^ "Ciclismo:Piemonte ribattezza Castellania". Euronews (in Italian). Di ANSA. Retrieved 25 March 2019. ^ a b "Fausto Coppi (Italy)". The-Sports.org. Québec, Canada: Info Média Conseil. Retrieved 16 September 2015. ^ a b c "Palmarès de Fausto Coppi (Ita)" [Awards of Fausto Coppi (Ita)]. Memoire du cyclisme (in French). Retrieved 16 September 2015. ^ "Fausto Coppi". Cycling Archives. de Wielersite. Retrieved 16 September 2015. Ollivier, Jean-Paul (1981). Fausto Coppi: The True Story. Translated by Richard Yates. London: Bromley Books. ISBN 978-0-9531395-0-7. Augendre, Jacques (2000). Fausto Coppi. London: Bromley Books. ISBN 978-0-9531729-6-2. Buzzati, Dino (1998). The Giro D'Italia: Coppi Versus Bartali at the 1949 Tour of Italy. Boulder, Colorado: VeloPress. ISBN 978-1-884737-51-0. Duker, Peter (1982). Coppi. Bognor Regis, UK: New Horizon. ISBN 978-0-86116-945-0. Fotheringham, William (2009). Fallen Angel: The Passion of Fausto Coppi. London: Yellow Jersey Press. ISBN 978-0-224-07447-6. Sykes, Herbie (2013). Coppi: Inside the Legend of the Campionissimo. Rouleur Series. London: A & C Black. ISBN 978-1-4081-8166-9. Trence, Salvatore (c. 1970). Fausto Coppi: "The Campionissimo". Yorkshire, UK: Kennedy Brothers. Wikimedia Commons has media related to Fausto Coppi.